The senators are among the most conservative members of their parties, which gives life to President Obama's proposals. WASHINGTON — Conservative senators from both parties announced their support for expanding background checks for gun buyers Wednesday, giving a burst of momentum to advocates of stronger restrictions. But big questions remain about whether President Barack Obama can push significant gun controls through Congress. The compromise between Sens. 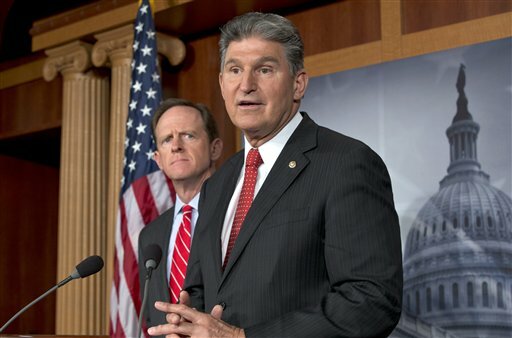 Joe Manchin, D-W.Va., and Patrick Toomey, R-Pa., boosted the chances that the Senate will agree to broaden required background checks, a step gun control groups laud as an effective way to keep weapons from criminals and the mentally ill. The senators are among the most conservative members of their parties, both have received “A” ratings from the National Rifle Association, and their endorsements could make it easier for hesitant colleagues to back the effort. Gun control advocates still face opposition from many Republican senators and resistance from moderate Democrats, including several facing re-election next year in GOP-leaning states. In the Republican-run House, leaders have shown little enthusiasm for Obama’s ideas, making that chamber an even higher hurdle. Under the agreement the two senators announced at the Capitol, background checks would be expanded to all for-profit transactions including sales at gun shows and online, with records kept by licensed gun-dealers who would handle the paperwork. Exempted would be noncommercial transactions such as between relatives. Currently, the system applies only to sales by the country’s 55,000 federally licensed firearms dealers. The agreement also contains provisions expanding firearms rights, and that concerns gun control supporters. Some restrictions on transporting guns across state lines would be eased, sellers would be shielded from lawsuits if the buyer passed a check but later used a firearm in a crime and gun dealers could conduct business in states where they don’t live. The agreement makes it all but certain that the Senate will reject a conservative blockade and vote Thursday to begin debating Democrats’ gun legislation. Besides broader background check requirements, the bill would also toughen laws against illicit firearms sales and provide a small increase in school security aid. Underscoring that the fight was far from over, NRA spokesman Andrew Arulanandam said the organization opposes the Manchin-Toomey accord. The group, which has fought most of Obama’s gun proposals and claims nearly 5 million members, said the focus should be on improving the nation’s mental health system and sources of violence like gangs. “Expanding background checks at gun shows will not prevent the next shooting, will not solve violent crime and will not keep our kids safe in schools,” the NRA said. In a letter to senators late Wednesday, NRA lobbyist Chris W. Cox warned that the organization would include lawmakers’ votes on the Manchin-Toomey deal and other amendments it opposes in the candidate ratings it sends to its members and supporters. In a written statement, Obama said he’d prefer stronger language than the compromise, but he said it represented progress. “It recognizes that there are good people on both sides of this issue, and we don’t have to agree on everything to know that we’ve got to do something to stem the tide of gun violence,” he said. Other highlights of Obama’s gun agenda — including bans on assault weapons and high-capacity ammunition magazines — seem to have little chance of winning approval in the Senate, let alone the House. Polls show more than 8 in 10 people back expanded background checks. Even so, the fight will be difficult in both chambers, especially the House, where increasing numbers of district lines are drawn to protect incumbents, said James Pasco, executive director of the Fraternal Order of Police. “They’re not going to have a constituency in every instance that is champing for that bill,” said Pasco, whose group has backed the drive for expanded background checks. The director of Mayors Against Illegal Guns, one of whose leaders is New York City Mayor Michael Bloomberg, said the compromise was a major improvement and showed that Republican support was possible. “Opposing yet another reform, which has Americans scratching their heads, is not a place where a national political party can afford to be,” said Mark Glaze. Reflecting concerns about unseen details about some gun rights language, the Brady Campaign to Prevent Gun Violence took a more tempered view. “While we continue to review the legislation, we believe a majority of the components are a good step forward,” said Brian Malte, director of the campaign’s network mobilization. There are no current, definitive statistics on how many gun sales occur annually and what portion occurs without the checks. A study in the 1990s found that up to 40 percent of transactions involved no checks.